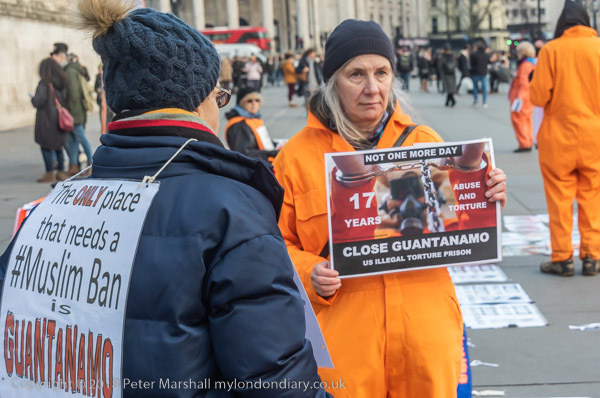 17 years ago, on 11th January 2002, the first prisoners were illegally brought from various secret US torture sites around the world to an illegal prison in a US base on Cuba, Guantanamo Bay. Most years since then there have been protests in the UK on the anniversary of this shameful camp, and in 2019 this took place in Trafalgar Square. As well as this annual event, there are also regular protest vigils both at the embassy and outside parliament. All of the detainees with a UK connection have been released from this torture camp, none of them ever charged or convicted of any offence. Like almost all of those held and taken to Guantanamo they were not terrorists, but innocent men who were unlucky enough to have been caught up as foreigners in the wrong place, when the US were offering a bounty for anyone delivered to them as a ‘terrorist’. Over 85% of those transferred out of the camp during the Obama administration were found by the US authorities to not even have been suspected of engaging in any terrorist activity. 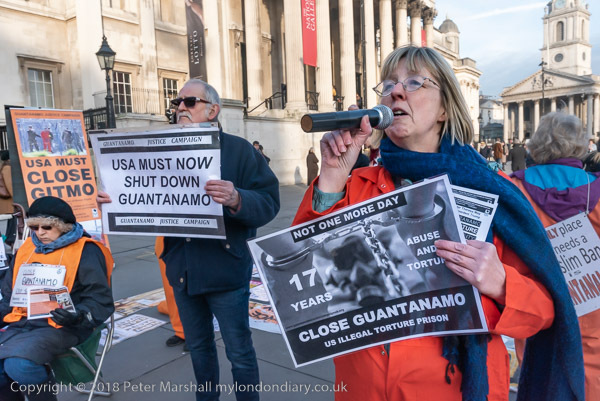 Because there are no longer any ‘Brits’ of any sort there, Guantanamo has more or less disappedared from our news, but it is still there, holding around 40 men. Around half of them there is little or no evidence against, and many of the rest nothing that would hold up in a proper court of law, but all have been held and routinely tortired for over 10 years. Obama had promised to close Guantanamo, but didn’t keep his word, though the numbers held their reduced significantly while he was president. A total of 780 men have been held there, and during the Bush years around 500 of them were released. Obama released 242, a large proportion of those still held, but around 40 were left when Trump took over. Since Trump became president, only one prisoner has left Guantanamo, Ahmed al-Darbi who pleaded guilty to being an al-Qaida member in 2014 and was transferred to serve the rest of a prison sentence in jail in Saudi Arabia in May 2018. Before that the last detainee had left on the final full day of the Obama administration, 19th January 2017. 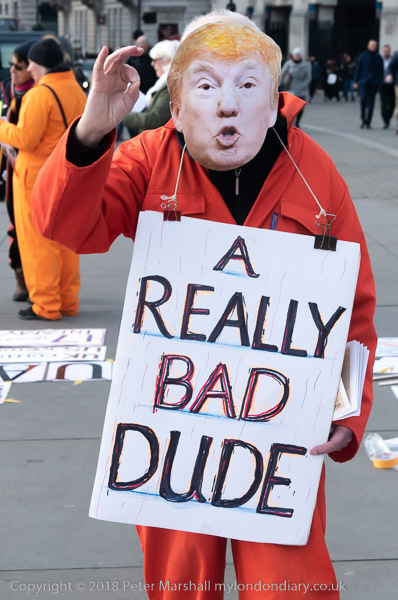 Trump has actually promised to put more men in Guantanamo, but has not yet done so. 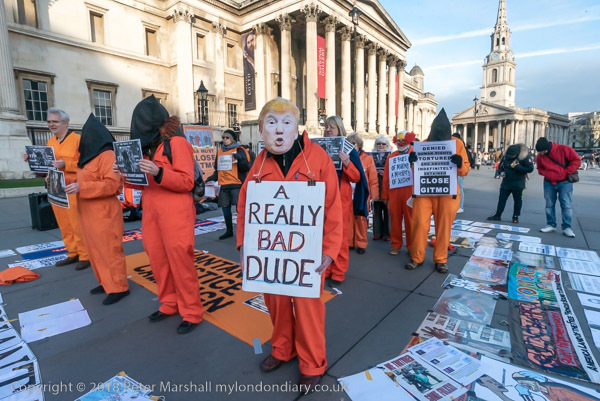 It’s important that Guantanamo and the remaining detainees be remembered, and that pressure is put on Trump to continue the programme of releases. Of the 40 inside, five were already cleared for release during the Obama administration. 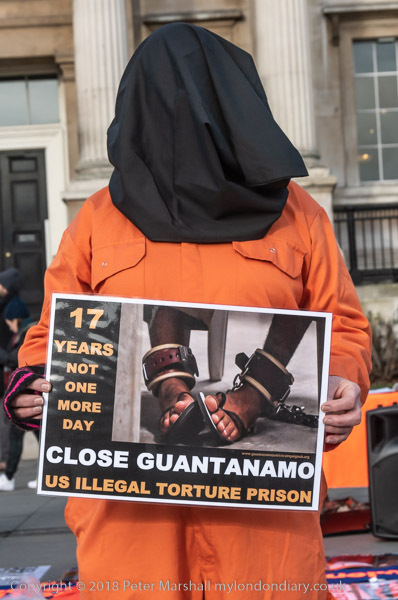 But it isn’t easy to keep GUantanamo in the news, and not easy to produce fresh images that would help in this. This entry was posted on Monday, April 8th, 2019 at 09:21 am and is filed under My Own Work, Political Issues. You can follow any responses to this entry through the RSS 2.0 feed. You can leave a response, or trackback from your own site.